Hi friend! I hope you’ve been having a lovely week so far. Today I want to share a sweet new recipe I developed when I had an over abundance of broccoli in the fridge that needed to be used ASAP. 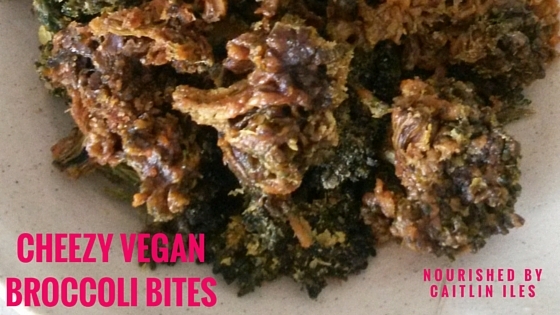 Now you all know what a fan I am of kale chips in different flavours so I decided to take the same basic premise and apply it to my favourite cruciferous veggie. And friend, I was not disappointed! I am happily sitting here eating two entire heads broccoli and wishing for more. I have found that broccoli gives these treats a bit more substance and can really fill you up as a snack or even a small meal. You’ll be using tahini, so you’re getting lots of bone-building calcium and cashews to add some healthy fats, proteins, and fibre. The nutritional yeast is actually a complete protein source, which is great for vegans of vegetarians who are looking to up their protein game, in addition to providing some B vitamins, iron, and chromium. This last mineral is crucial for helping maintain balanced blood sugar, a key to keeping inflammation in check. Broccoli is a fabulous cruciferous veggie that contains sulfur compounds that help with liver detoxification. A healthy, happy liver is key to maintaining glowing skin, a healthy weight, proper digestive function, and shiny hair, so make sure you don’t skimp on the brassicas! A few other great options are cauliflower, Brussels sprouts, kale, turnips, cabbage, kohlrabi, rutabega, collard & mustard greens. Alrighty, now that I’ve convinced you these bad boys are definitely super powered snacks, let’s get to the good stuff! In a food processor combine cashews, tahini, tamari, rice vinegar, water, nutritional yeast, paprika, garlic & onion powder until smooth. Place broccoli florets in a large metal bowl and pour sauce over top, tossing and massaging until completely coated. Spread out evenly on trays in a dehydrator and let dry overnight on highest setting. Conversely you can roast them in the oven low and slow, around 200F until fully crispy.